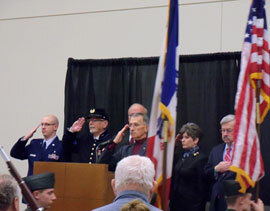 The state’s annual Veterans Day ceremony was held today in Des Moines today. Iowa Governor Terry Branstad offered the keynote address. “Our military veterans have submitted a foundation of freedom and liberty that we continue to enjoy, and that all generations have enjoyed,” Branstad says. He says veterans of all ages share a common ideal. “The common thread among veterans is — whether they recently returned from serving in Iraq and Afghanistan, or whether they served in World War Two, or Korea, or Vietnam — they have a fundamental belief in freedom and opportunity, and the opportunity to extend that to other parts of the world,” Branstad says. Branstad wrapped up his message with this thanks to veterans. “To all of the veterans with us today, please know that we the people of Iowa, respect and appreciate the service that you have provided, and the unbelievable sacrifice that you have made, the courage that you have shown,” Branstad says.